Martin Allen is demanding “something back” from his players after witnessing Chesterfield’s losing streak reach four games with a 1-0 defeat at Hartlepool United. The Spireites were beaten by a sweet low finish by Pools midfielder Nicky Featherstone in the 17th minute at the Super 6 Stadium. Chesterfield had started the season in top gear with three straight wins but they have gone into reverse alarmly quickly. Allen’s side could only huff and puff but they failed to blow the Hartlepool door in with the manager conceding the size of the defeat could have been heavier and is promising “changes” rather than “tweaks”. 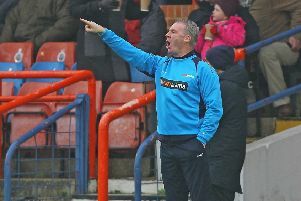 He had been unhappy at his side’s display in the late home defeat to his former employers Barnet on Saturday and was even more dismissive of the Spireites performance against their old EFL foes. “We do everything we can [for the squad] with the team of staff we have,” said Allen, who said the travelling army of almost 500 fans were short-changed. “We try to make things the very best we can for these players, whether it’s training, ice baths, food. “Our players get the best of everything I promise you that and I want something back. Allen explained that he would not be looking for any more new signings, even if they can free up money by moving on several players. Allen says he will take the next couple of days to assess things before the Spireites go again on Saturday against Leyton Orient, but he will be making alterations to his team. Zavon Hines should have beaten Scott Loach in the first half from close range before the Hartlepool keeper made a good diving save from a deflected Sam Muggleton shot. After the break there was little threat from Chesterfield although Kyel Reid had a shot blocked during an encouraging performance from the second-half sub who could well tart against the O’s. “I’m going to have to look at how to make our side more competitive,” he said. “Hartlepool could have scored three or four goals, it wasn’t good enough. “It’s back to the drawing board. We don’t need tweaks, there are going to have to be changes.